Believe it or not, roasting a chicken can be tricky. Just like turkey. You want it to be done, but moist, without any meat ending up dry. And when something has bones, it can be a lot harder to tell if it is really done. 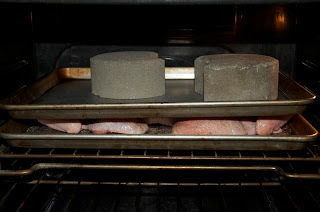 Cutting the back bone out of the chicken and laying in flat takes the guess work out of it. Normally I do this on the grill, but my deck is still covered in snow so I can't get to my grill...yet. (As we speak, our heat wave of 45 degrees is melting snow quickly...I can't wait to get back to my grill!) So without the grill I decided to try it in the oven, and it worked just as well. Preheat the oven to 375 degrees. 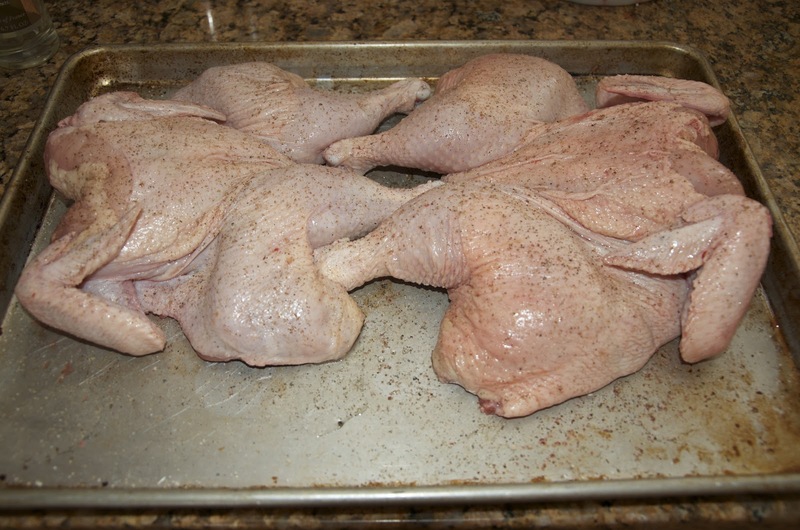 Place chicken, breast side up and flat, on a sheet pan. 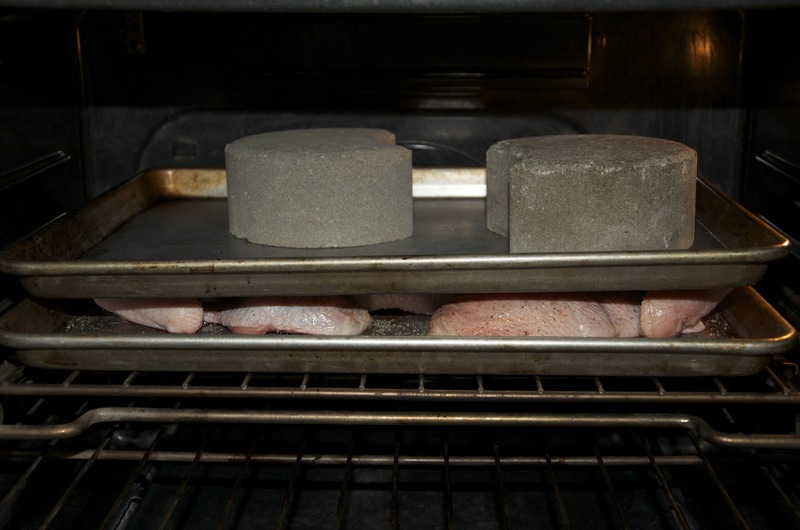 You won't need to tuck the wing tips because of the second sheet pan used as a cover. Smooth the oil over the chicken, salt and generously pepper. 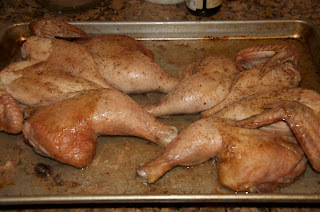 Place another sheet pan (coat olive oil on the side that will touch the chicken) over the top of the chicken, then put to bricks on the top of the sheet pan. 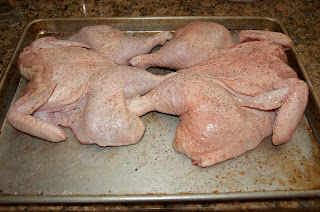 Place in oven and cook 35-50 minutes depending on the size of your chicken. When the chicken has about 10 minutes left, check to see how brown it is. At this point you can remove the pan to darken the bird, but it isn't necessary. 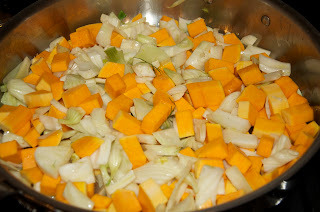 Reduce the chicken stock by 1/2 in a small sauce pan over medium high heat. Reduce heat to medium, add the herbs and ghee, whisking well. Salt and pepper to taste and drizzle over chicken when you serve it. 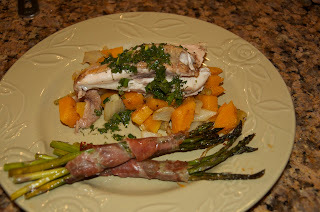 Roast Chicken accompanied by fennel/butternut sauté and prosciutto wrapped asparagus.